PinkyPiggu: 928 Yishun Laksa ~ Laksa, Laksa In A Bowl, Which Is The Best Of Them All? 928 Yishun Laksa ~ Laksa, Laksa In A Bowl, Which Is The Best Of Them All? 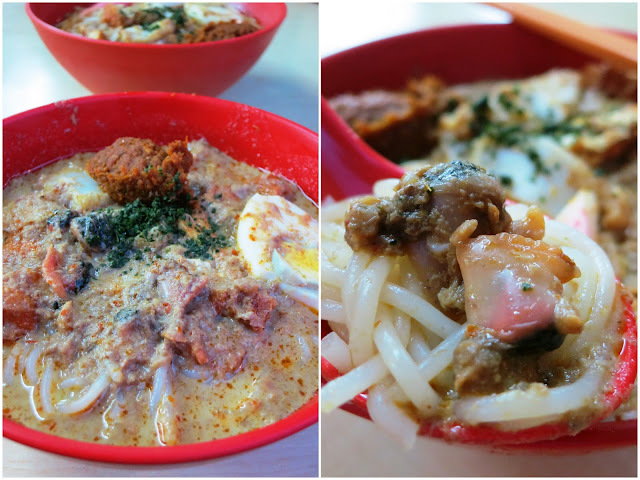 Laksa, laksa in a bowl, which is the best of them all? Seriously, I don't care. As long as the taste resonate with my tastebud, it's a good bowl of laksa. There is beauty in diversity, I appreciate that the same dish receive different interpretations under different hands, else every dish will taste the same and it will become... boring. 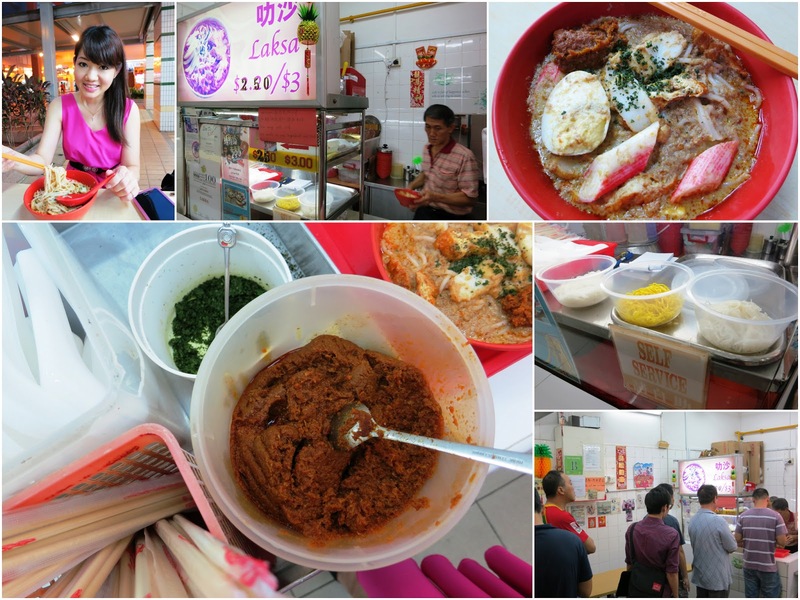 I wouldn't say 928 Yishun Laksa is the best among all, but I would say it's one of my favorite stalls. Those residing in the north would not be unfamilar with it I guess. A perpetual queue can always be seen at this tiny no-frills eatery located at the ground floor of Yishun blk 928, just behind the Yishun bus interchange. While queuing, one couldn't help but notice the display of accolades accredited by local TV food shows which proudly adorned the stall's glass panel, an affirmation of the laksa's tastiness and popularity. Take the bowl of laksa back to your seat and enjoy! The small bowl at $2.50 comes with a serving of yellow noodles / thin or thick bee hoon, with ingredients including half an hard-boiled egg, slices of fishcakes, tau pok, beansprouts and cockles or crab sticks. Portions are generous and substantial for a meal in itself. My order was for a bowl of laksa with thick bee hoon without cockles and beansprouts (uncle, mai hum mai tau gay!). Haha yes, it's my preference so please don't judge me. My friend went for the 'default' with everything all in. While the ingredients are fresh, the success of this laksa lies in the gravy which is nothing short of amazing. We both love it! It's very rich and creamy with the wonderful fragrance of sweet coconut milk balanced by the savory notes of dried shrimps. It's so easy to forget about the calories and slurp the gravy down to the very last drop. I must warn you, it's dangerously delicious and addictive!! The drawback about eating here is that seating capacity is very small and the lack of fans means having to sweat it out in our passionate Singapore weather. It can be a tad uncomfortable which is why my friend (who lives nearby) always prefers to do a takeaway. No worries about the laksa becoming soggy as the uncle will always pack the gravy separately. I find the chili not hot enough but the gravy is decent. Dessert from same eatery? You mean the one at the shop beside it. I think I know which coffeeshop u ate your chicken wings from. 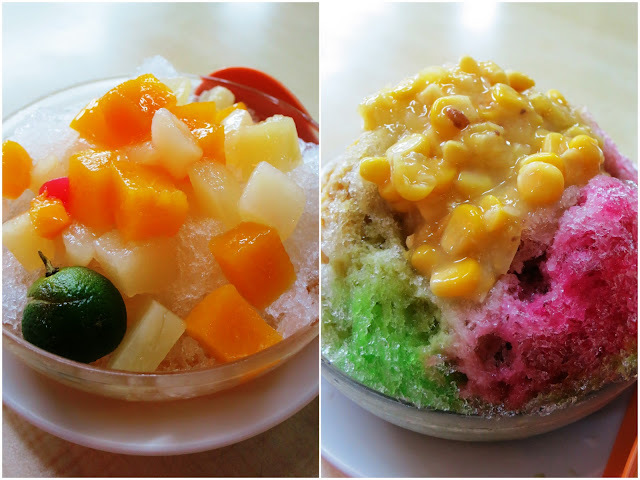 The one at Blk 925 right (the coffeeshop with the chicken rice which does a roaring biz)? Yes, dessert is from the same eatery, just beside the laksa stall. Noticed the photos? It usually gets sold out by 5pm! Fricking good popiah!